Back Alley Brewing Co. – Turning Waters Brewing Co.
Brenda & Ford started their craft beer adventures while living in South Florida in 2011 brewing their first batch of beer on an electric glass stove top (wouldn’t recommend). With their Organic Double IPA strapped in the front seat of the moving truck, they made their cross-country voyage to Wabasha, MN, where Brenda grew up. With a few stops along the way in Nashville, TN, at Jackalope Brewery and Ram Restaurant & Brewery in Schaumburg, IL, they finally reached their destination with the keg ready to be enjoyed. Roll forward to today, January 2018, Brenda & Ford have lived and worked in Milwaukee, WI, where they worked for Rock Bottom Brewery. Next adventure took them to Minneapolis, MN where they enjoyed working at Lucid Brewing, now known as Inbound BrewCo in downtown Minneapolis. Brenda also had a short stint learning about Belgians and ciders working for Artisinal Imports. Lastly, they helped open up LynLake Brewery in Uptown Part of Minneapolis, where Ford learned to brew on a larger scale and Brenda learned more managerial skills. 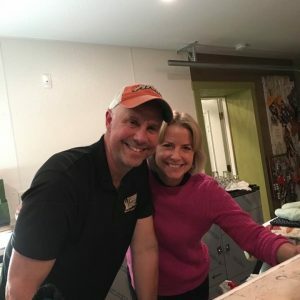 Thankful for the experiences, they took a leap of faith and purchased Turning Waters Bed, Breakfast & Adventure in Wabasha, MN, with the goal of renovating their three-car garage into a brewery pub. Mission accomplished, six years later Hoppy Girl Brewing, LLC dba Turning Waters Back Alley Brewing Co. opened for business on Thanksgiving night.